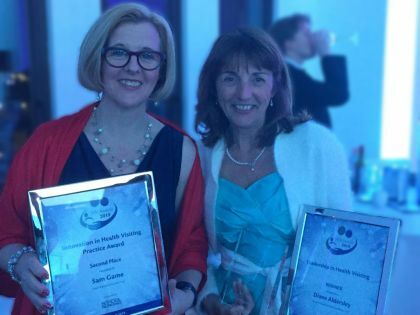 Two Warwickshire health visitors have been recognised for their work at the national Journal of Health Visiting (JHV) Awards which aim to highlight and reward excellence and promote evidence-based best practice. Diane Aldersley, a Clinical Lead in Health Visiting, based at Southam Clinic received the top award for Leadership, while Sam Game, Clinical Lead based at the Ellen Badger Hospital, Shipston, came runner up in the Innovation category. Both women invested time and energy, on top of their busy management roles, to improve the support for mothers and babies in Warwickshire. Diane is an active participant of the Mother and Baby in Mind (MABIM) leadership programme and has coordinated a proactive group of perinatal mental health champions within the health visiting team. She has also chaired and driven forward a multi-agency forum to develop a new set of Parent-Infant Mental Health and Wellbeing (PIMHW) Pathways for the 1001 critical days. The 1001 critical days are the period between conception and a child’s second birthday. During this time of rapid growth, babies’ brains are shaped by their experiences, particularly the interactions they have with their parents and other caregivers. What happens during this time lays the foundations for future development. Diane’s chairing of the PIMHW pathways group, and her work in developing a shared business case for specialist PIMHW health visitors and midwives, has considerably strengthened collaboration between Coventry and Warwickshire health visiting services, and also between health visiting and maternity services. Sam Game, who has a post-graduate-level MSc qualification, uses her passion and knowledge in infant and child mental health to help increase the mental health knowledge and awareness, not only of health visiting staff, but also more widely across multi-agency organisations and partners. Sam has also set up an early intervention mental health charity: Standing in the Gap which works with children and families with 0-11 year olds, promoting good infant and child mental health, and supporting families and professionals looking for help. On top of this, Sam has written a book: The Glasses Fairy to help children who need glasses. The book is based on Sam’s own experience of having two children who wear glasses, as well as her wealth of health visiting knowledge and behavioural management principles. Warwickshire County Council commissions the Health Visiting Service through South Warwickshire NHS Foundation Trust. The Journal of Health Visiting is a monthly publication which aims to support and educates through peer-reviewed professional articles and educates through peer-reviewed professional articles.